Do you own a copy of The American Boy’s Handy Book ? If not, I’d recommend putting it on your wish list. Here’s a classic DIY guide geared towards projects children (with adult supervision) to teens and adults can all enjoy. If you’ve never heard of the American Boy’s Handy Book, you should definately check it out. The book includes a wide range of DIY projects, most of which are far more sophisticated DIY projects than you’d find in a Cub Scout guidebook. The projects in the book range from the fantasy (Mark Twain raft) to the questionable (DIY fireworks, various projectile devices, etc.) to the totally awesome (DIY boat building, wind skates, and so much more!). A must for the ‘do it yourself’ person in your life. Do these knot types sound familiar? Still just tying granny knots and square knots? Learn how to tie knots, lashings, splices and much more with this free, illustrated, 64-page PDF eBook of the 1917 classic knot tying guide, Knots, Splices, and Rope Work by A. Hyatt Verrill complete with diagrams. Just came across this great how to video on YouTube showing how to make a DIY Monkey Fist Knot Keychain. If you have some paracord or 550 cord leftover from your last projects, why not give this knot a try yourself. A monkey fist knot looks complex and is sure to attract attention. Try using a marble for the core as an alternative to the ball bearing shown. Got some extra parachute cord (aka 550 cord or paracord)? Here’s a project that is both functional, attractive, and handy. 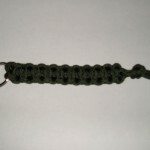 Making a paracord lanyard or bracelet is a convenient way to carry a length of 10 feet or so of parachute cord for emergency or survival use. Following a few simple knot tying methods, you can easily create a bracelet or lanyard out of 550 cord for camping, survival preparedness and as an attractive key fob. Why Paracord? Used in parachutes for the military, this tough string has a tensile breaking strength of 550 lbs! Furthermore, it is composed of 5 or 7 inner strands that are very strong on their own and well suited to making a make-shift fishing line in an emergency or survival situation. 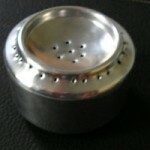 It is also made of nylon so it is lightweight and resists mold and mildew. Where to get parachute cord? Online or military surplus outlets. Note that there is alot of knock-off paracord available, that may serve fine for a bracelet, but might not have stength needed for camping or survival use. So be sure to check for a military rating if you intend to have it on hand for emergencies.